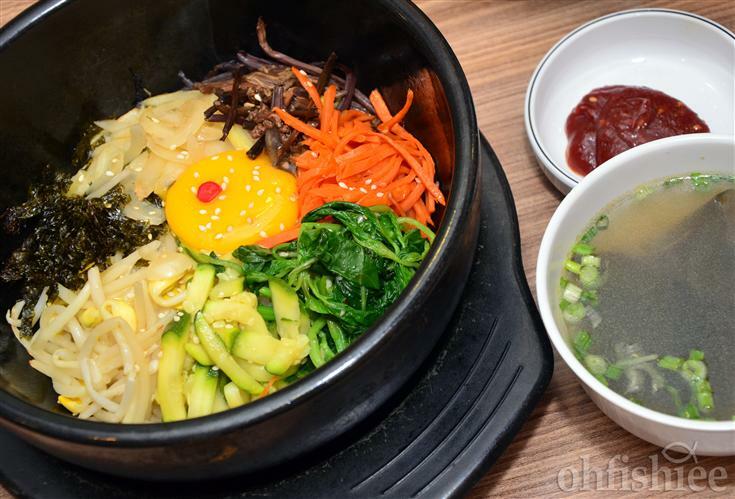 Ever craving for authentic Korean cuisine but staying away from the Korean food chains? 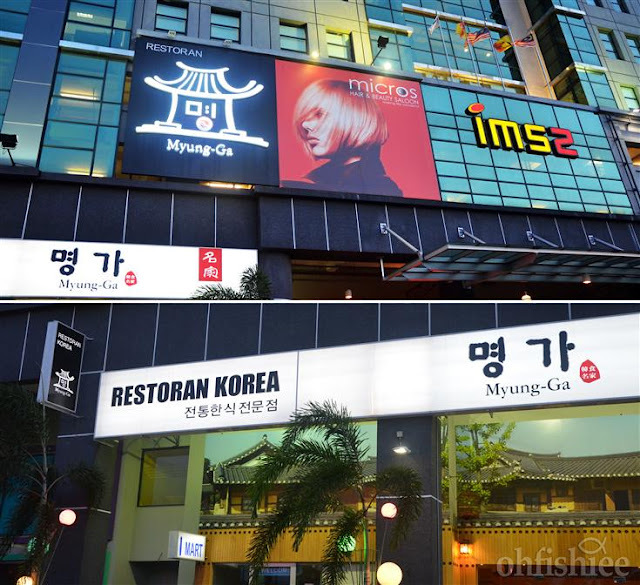 Myung-Ga is the right place to go! Strategically located near Bukit Raja Shopping Centre, Myung-Ga is no longer a new icon around the neighbourhood. 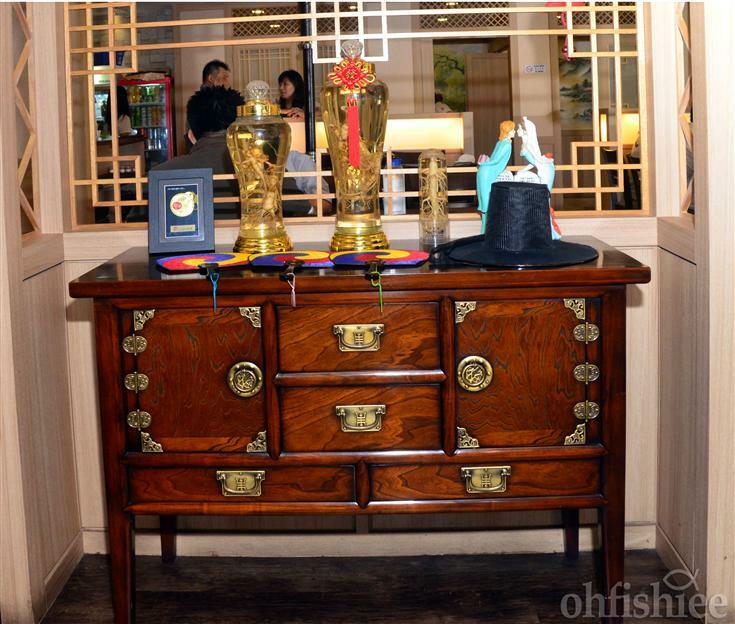 Operating for less than a year, the business has now flourished with patrons in large groups especially during weekends. A pleasant atmosphere with unique contemporary interior to dine in. 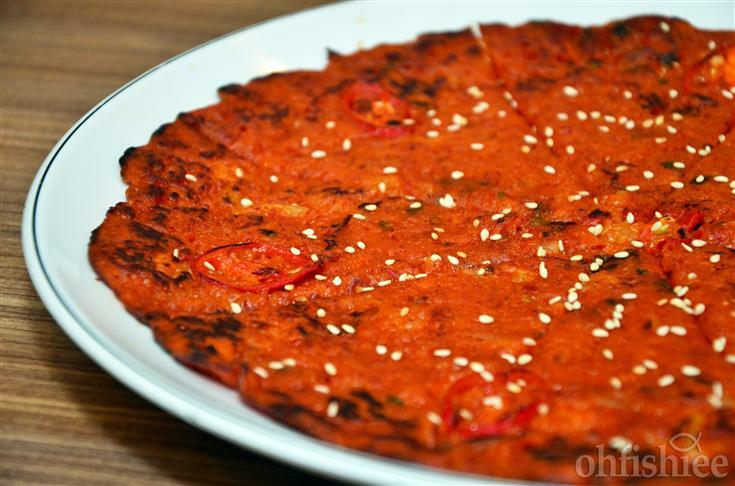 As a tradition in Korean restaurants, our starter is preceded by the side dishes (more precisely known as "Pan Tan"). It comes in 8 generous choices, and their waiters are more than pleased to refill each time we finish it. I've sampled some with really pungent smell, but Myung-Ga's homemade kimchi is pleasantly sweet and sour, not too strong in taste, which I personally love it! The owner is so generous to give us few bottles of liquor to try on. 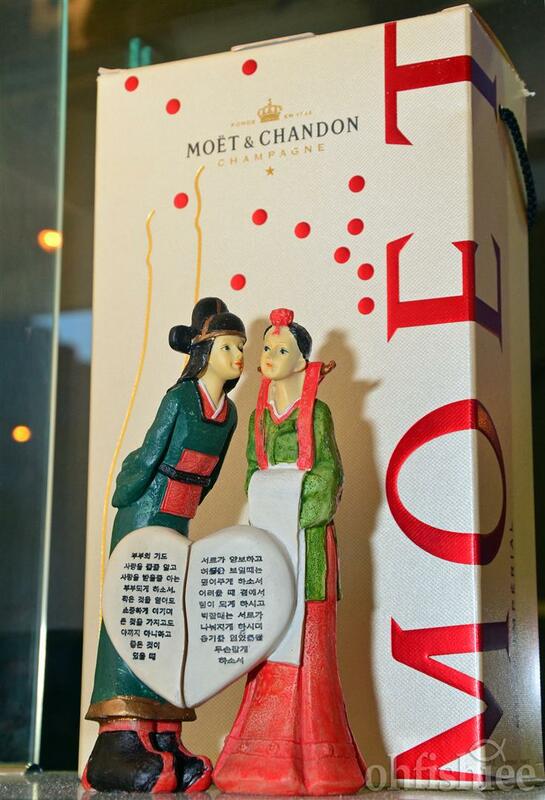 Akin to Japanese Sake, its alcohol level is 19.8%, and tastes smoother when goes with some fruit juices. The starter of the evening begins with Gun Man Du, essentially the same as Chinese pot sticker or Japanese gyoza: a pan-fried and steamed dumpling stuffed with pork. The dumpling itself is a trifle bland, but this is made up for the dipping sauce, salty with strong aroma of green onions. This is my first experience with some pan-fried sweet pumpkin pancake, I feel as if I'm starting off the meal with some dessert. 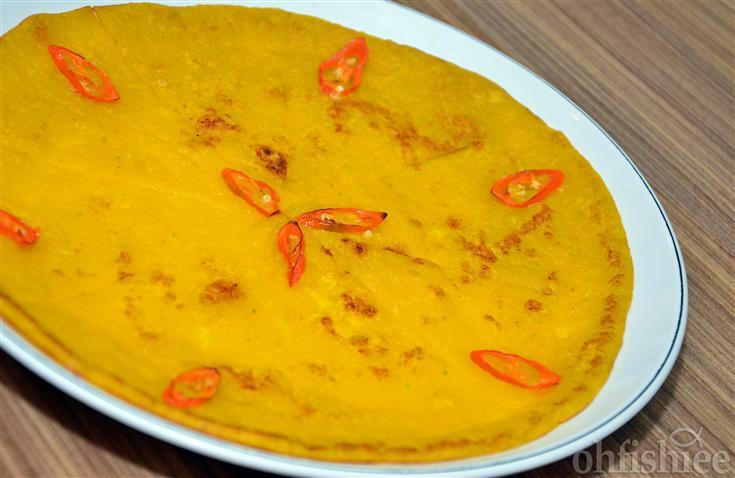 Nevertheless, it is rich in the goodness of pumpkin. One of the thinnest yet rich version I've tried. 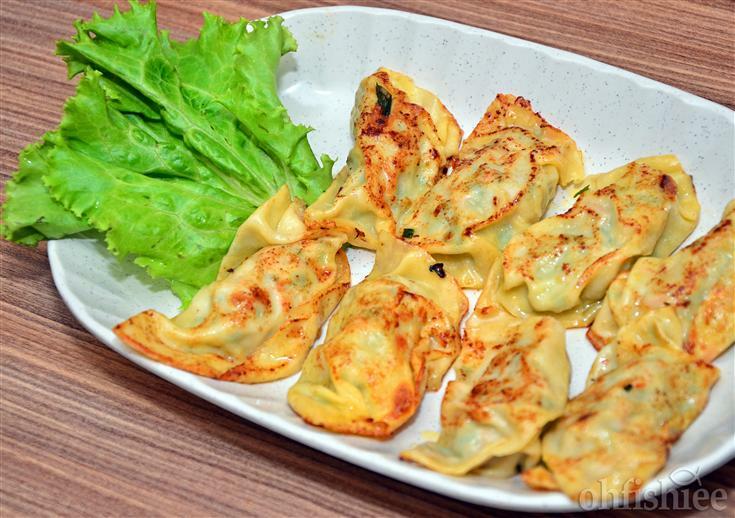 It is very crispy on the bottom, with the rich preserved cabbage lying in it and sprinkled with generous amount of sesame. 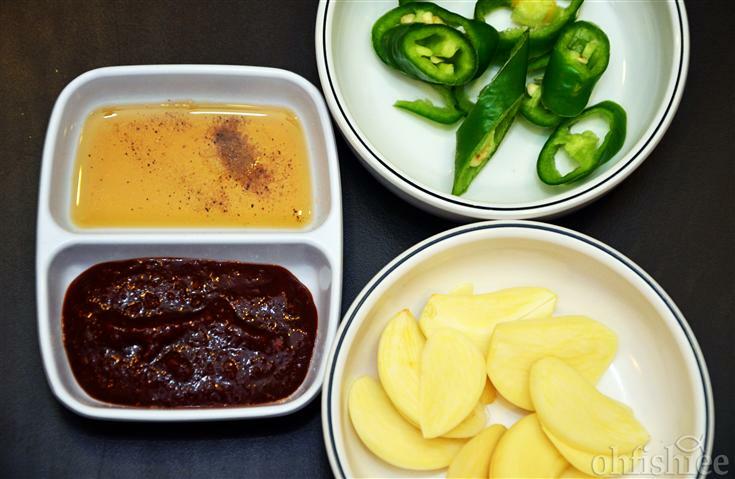 I'm a fanatic of Korean rice cake, and I have to admit that this platter of Rice Cake and Vegetables Simmered in Red Hot Pepper Paste is done really well with thick, piping hot sauce! 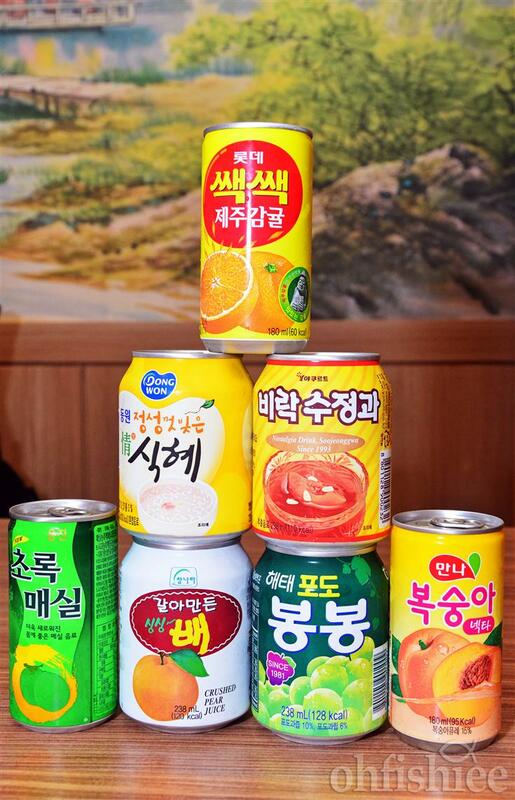 Particularly good for spicy food lover. I'm delighted when this hot stone pot is served with a bowl of soup, as not many places do the same. This vegetarian delight of mixed vegetables is bland in natural, but when mixed in the sauce, it turns out to be a flavourful pot with a good ratio of sweet and spicy taste. 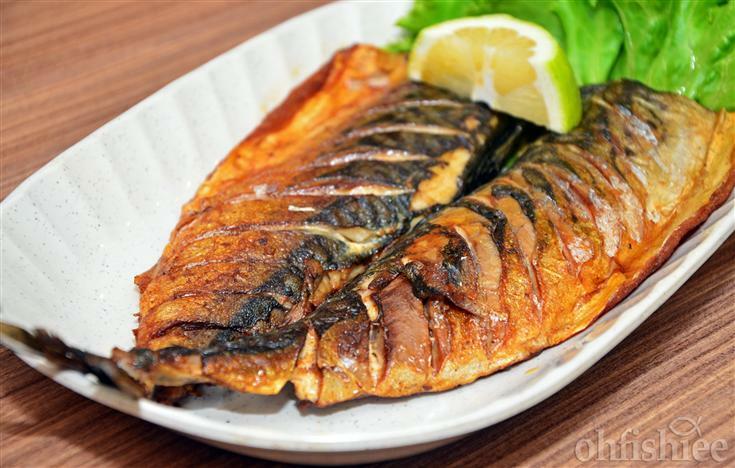 Grilled into golden brown perfection, it is crispy outside and tender inside, retaining the fresh, juicy flesh of the fish. Highly recommended when served with a zest of lemon. Myung-Ga self-claims as a specialist in BBQ meat, so I must sample their signature Kalbi! Let's see what is done to these pieces of marinated pork ribs. 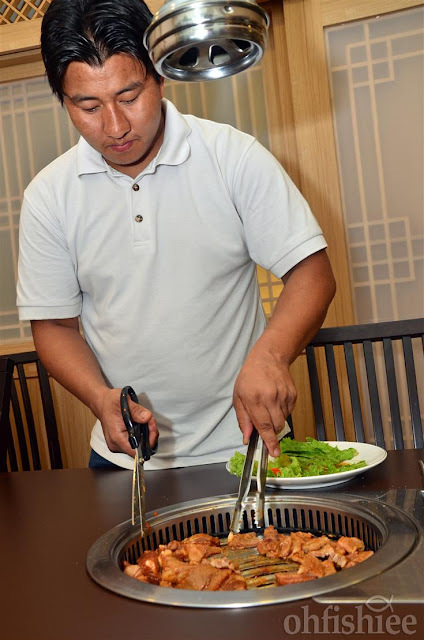 The waiter does a good job at the built-in grill on a separate table, so that the smoke doesn't pollute the entire room while the aroma tickles out nose. 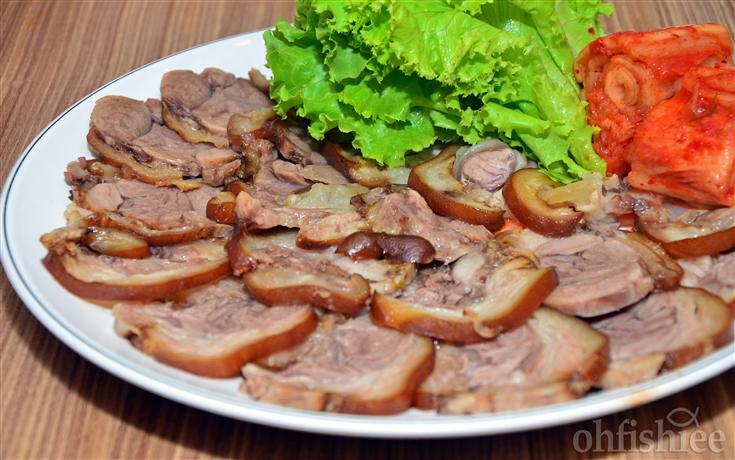 In a double-bite size, the grilled pork ribs are soft and chewy with minimal greasy fats. There you go for quality meat and marinade! 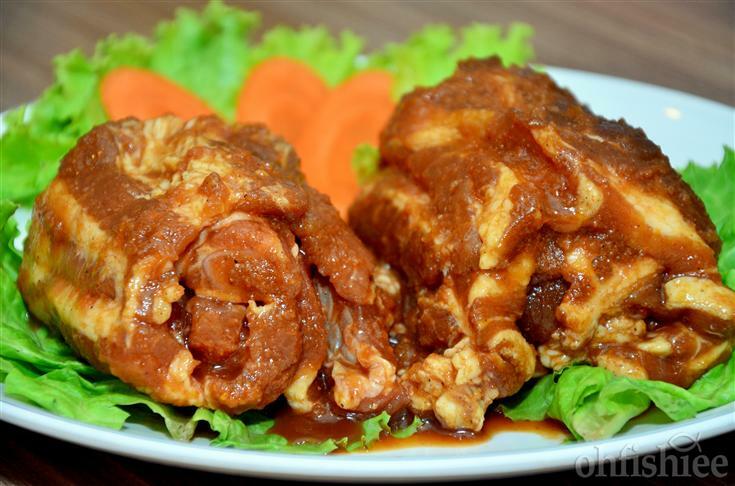 It is served with spicy sweet sauce, chilli cuts and garlic. 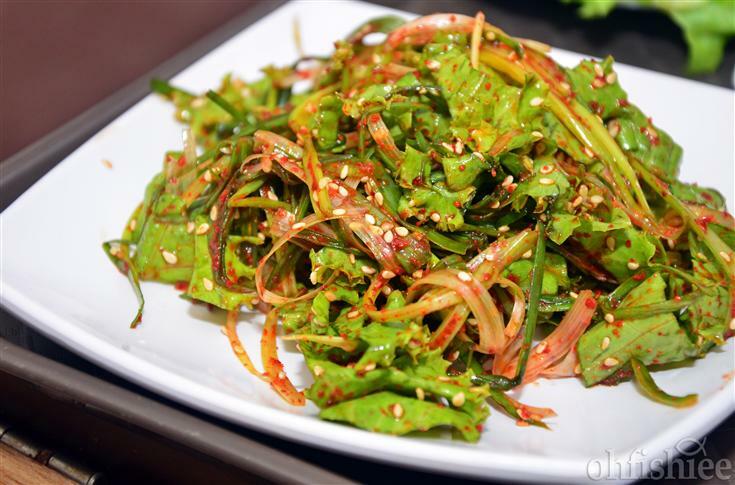 And the spicy chopped lettuce sprinkled with sesame is the healthy way to go for! I rarely take swine, but knowing that this is the Chef’s recommendation, how can I resist it? Very nicely done for the firm meat, and it is not fatty as well! Best to wrap the meat and kimchi in lettuce and it will keep the flavours going. 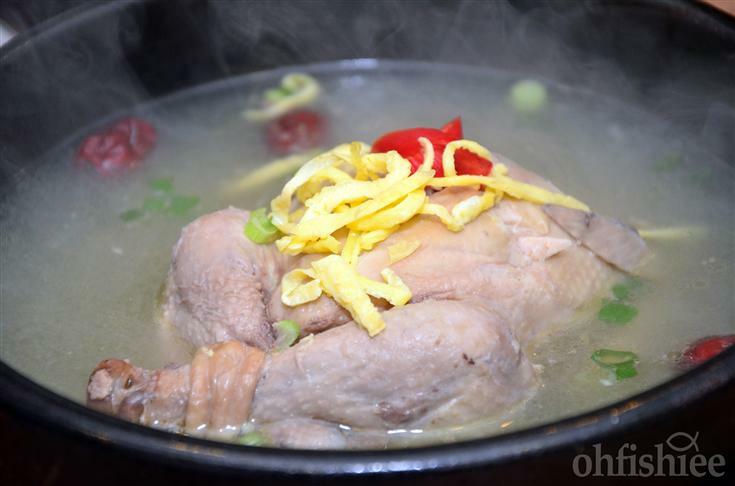 The hot pot of Chicken Ginseng Soup is served piping hot from the kitchen, best to be taken after the liquor. A very light broth with hints of Korean ginseng, delicious! 1. Everything from service, to presentation, to quality of meat, reminds me of a Japanese BBQ place, and that's a good thing. 3. 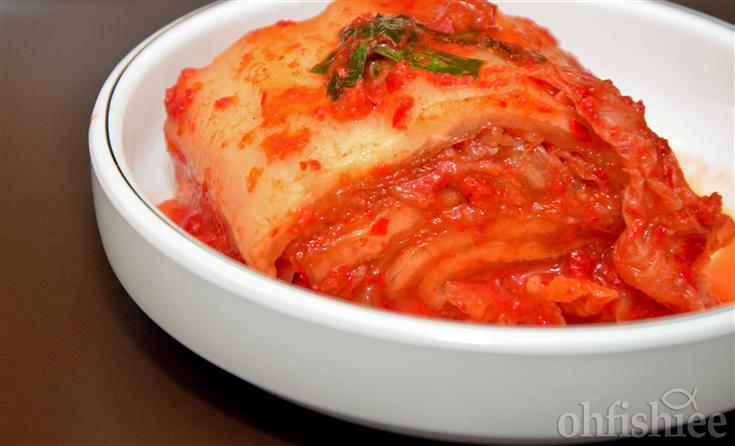 Most dishes are quite light, not so rich in taste. Some may not like it, but it's for the goodness of health. 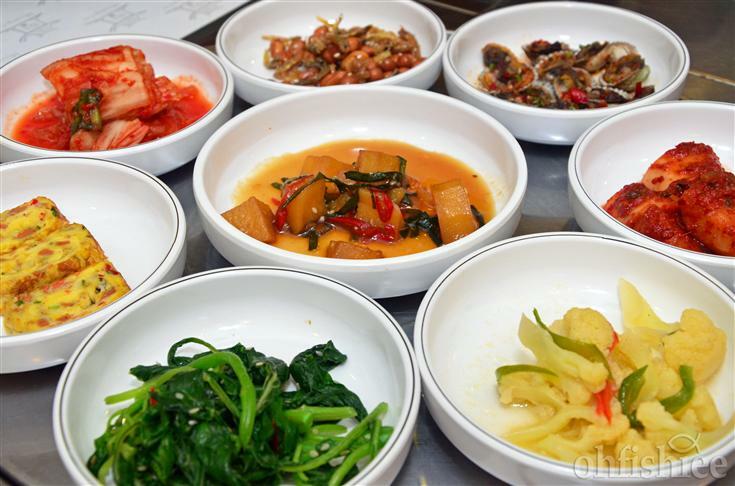 Oh my, I love Korean food esp for the little plates of sides served. Ok, Bukit Raja is quite close to where I stay and now I have to get my other half to take me here. are Koren food spicy ? 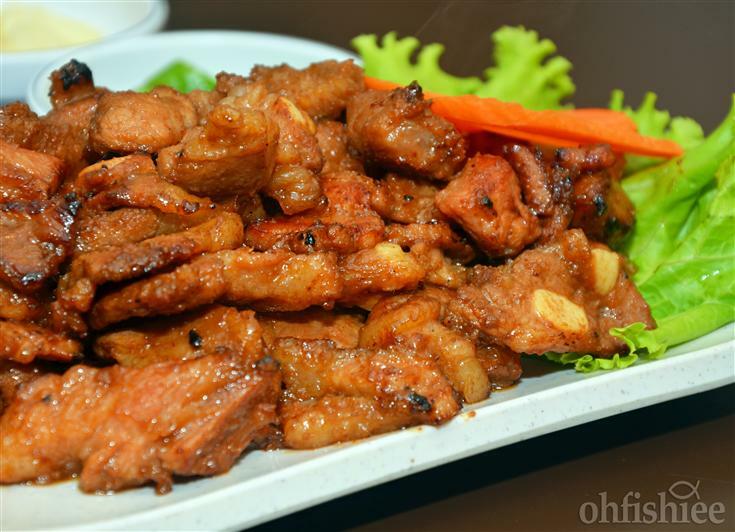 I'm not a big fan of Korea cuisines but once I saw the grilled pork ribs, directly my saliva dropping. Hahaha..
We like Korean foods but sometime feel their price a bit high as they just use very normal ingredients..
Everything looks so good and so fresh. I've become such a fan of Korean food! 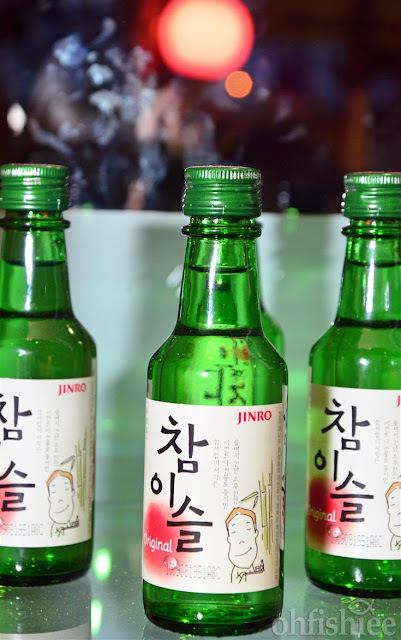 U're reminding me of my trip to Korea........ Dang, my Korean Chicken Ginseng Soup!! and I ask them to refill the small dishes and they told me that it is all finish..
seems reluctant to refill for us.. I love it when restaurants give complimentary first dishes. DROOL!!! 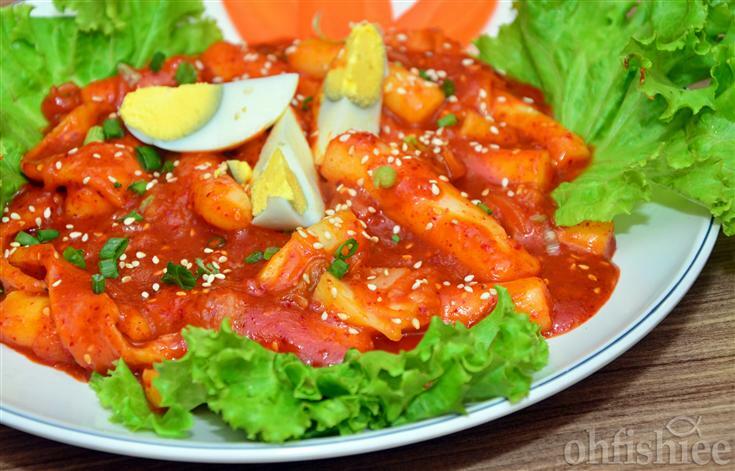 I love Korean food and all dishes are something that I'd love to order too! 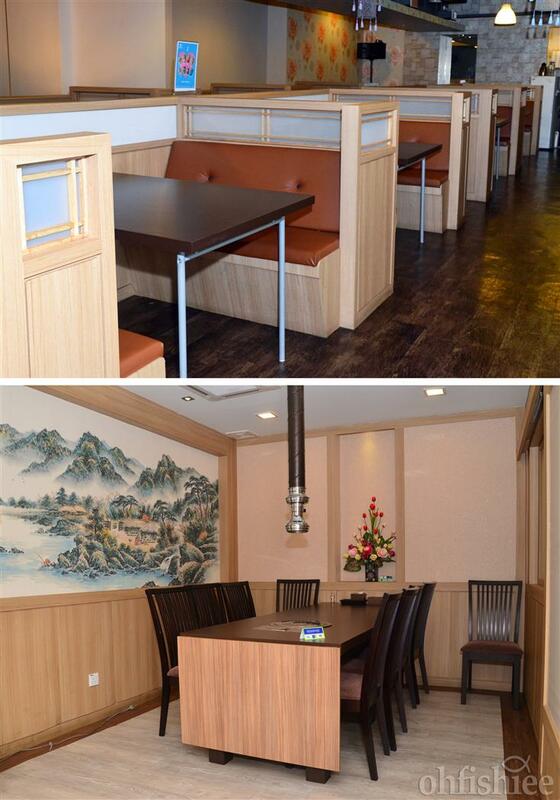 Unfortunately there is no good Korean restaurant that I like around here....40 mins away then there is Korean town. I need to go there this weekend. YUM!! Not sure my family would have the courage to try our Korean cuisine. Thanks for sharing, anyway. Your photo shooting skills made the food looks really good. It's been so long since the last time i had wine... XD btw dear if you dont mind i have one question, what digital camera you use to snap all this yummylicous food????? ?